This topic introduces common user-interface elements and useful tips to work efficiently with Microsoft Social Engagement. You'll get a basic understanding of the application’s logic and conceptual approaches to help you start to work with the various features and areas. To provide you the best experience with Social Engagement, it's a good idea to keep your browser updated to the latest version. To use Social Engagement, you must have an Office 365 subscription and be set up as a Social Engagement user by your Office 365 Administrator. This means that your organization also needs to have a license for Social Engagement. Use the bar at the top of the page to move between all of the different areas of Social Engagement. Pages that you see depend on the permissions that your system administrator assigned to you. App launcher: Quickly go to your Office 365 portal and select from your available services. Open default page: Start a fresh analysis on Analytics > Overview and reset all active filters. Navigation: Click this button to see the application areas and quickly switch to the area that you are looking for. Sign out/Change Profile: You can change your profile by clicking the View Office 365 profile option or Sign out from Social Engagement and your Office 365 user account. User options: Get one-click access to the My Preferences area, and see further information about Social Engagement. Help options: See context-sensitive help topics that apply to the area you’re working in, and quickly access the Social Engagement forums and support contacts. Application areas: The main areas to work in Social Engagement. Search Setup: Create and edit search topics, defining the posts that Social Engagement acquires. Get an overview of your solution’s data acquisition status and its progress towards the post quota. Maintain lists of blocked content to optimize the quality of your data. Analytics: See widgets that show the data in your solution. Switch between different pages in Analytics to see more detailed information about the areas that matter the most to you. Add filters to slice and dice your data according to your business needs. Private Messages: Find all private messages in the solution with a single click. This is not an application but a shortcut to a view on the post list with the filter for private messages enabled. Social Center: Create and manage real-time streams of posts that match a selected data set. Depending on your user role and license type, you can share streams with other users of your solution. Activity Maps: Create and manage activity maps to see real-time visualizations of posts with location information. Show this on a large screen and let your audience know where in the world your topics are discussed. Social Selling: Work with the Social Selling Assistant directly from within Social Engagement and get recommendations on relevant and shareable content that really matters to you. Alerts: Create and manage alerts to get the most recent posts or significant changes delivered by email to the specified recipients. Settings: All users can define how the application displays for them. Administrators can manage user roles, set system-wide settings, and configure many more options. Help: Visit the Microsoft Social Engagement Help Center (opens a new website) to see the latest help topics. In most cases, the first thing you’ll see when you sign in to Social Engagement is the Home page. When you don't have any search topics set up yet, you'll be guided to create your first topic. If another user already created search topics, you can go to the Analytics area to get insights from a data set that contains all posts that all search topics gathered in the specified time frame. Analysis focus: Define the data that your current analysis focuses on, and select a search topic, a category of search topics, or all search topics. You can switch between the different options at any time to narrow or extend your data set. Filter section: Add or edit filters to slice and dice your data set according to your needs. At a glance, see the filters that are applied to your current data set, and quickly edit or remove them. Time frame: Select the dates for which you want to analyze your data. You can select a custom date or predefined values. Data summary: See the number of posts and the trend of your current data set. 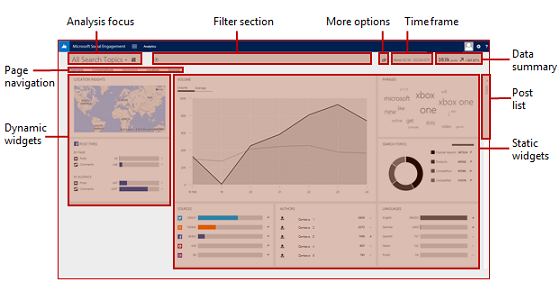 Page navigation: Move between the different pages of the Analytics area. Each page provides a more detailed view of important aspects of your data. Post list: Expand this area to see the most recent posts that match your current data set. Update your data set or your time frame, or load more posts to dive deeper into the contents. Take action and engage with your audience directly from within the application. Administer your Microsoft Social Engagement solution, and set the options for your solution and its users. To set up your solution and get your users started quickly, see Set up Microsoft Social Engagement. Page navigation: Move between the different pages of the settings area. Each page lets you set options that apply system-wide or to individual users only. Depending on your user role, you may not see all pages in the area. Please note that Microsoft Social Engagement may enable access to third-party services, such as Twitter, Facebook, Tumblr, YouTube, and blogs whose privacy practices may differ from Social Engagement. Your use of such services, and any information you provide to them, is governed by their service-specific privacy statements. When establishing these connections, certain data, such as the search query used to retrieve the Social Content and your IP address, may be shared with those services. You are encouraged to review these other privacy statements. You are also encouraged to review the Microsoft Online Services Terms. 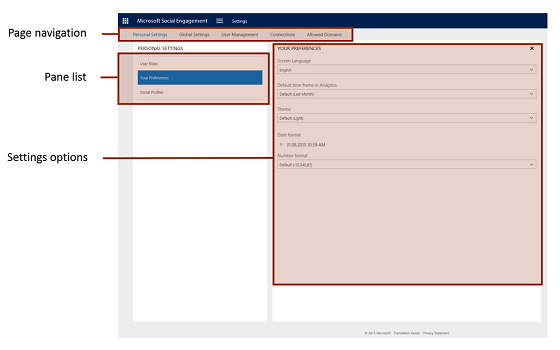 Microsoft Social Engagement stores customer search configurations and data curations in tenant-separated databases (customer data). The customer data is then cached on the server side in an internal application, to allow common retrieval indexing for the sole purpose of maximizing solution performance. Access to index cached data (customer data) is handled exclusively by the internal application, and does not allow users to access or modify index cached data interactively in the internal application. After a subscription license agreement is terminated, customer index cached data is removed after a period of 180 days, according to our data retention policies.